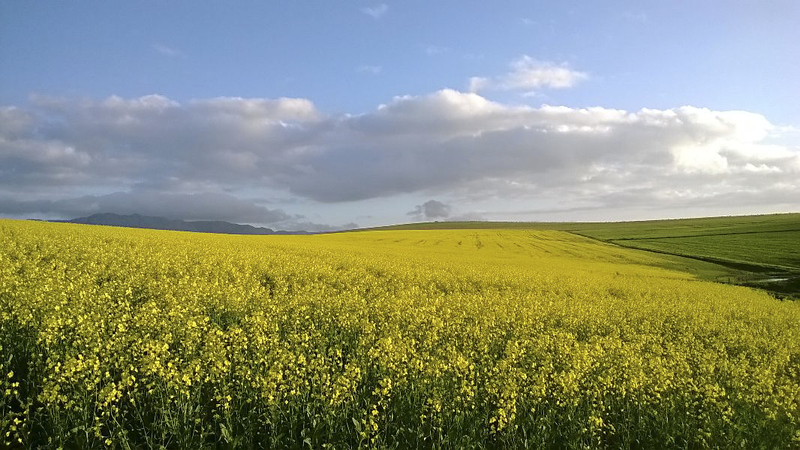 October and November might just be some of the busiest months for farmers in the Overberg, an area known as “the wheat basket of South Africa”. It is harvest time. From before sunrise to late at night one can hear and see farmers with swathers, combines and balers working the fields. First the swathers come in to cut the stems of the wheat and form a windrow which is left to dry before combining or further harvesting. Then the combine comes in to loose the head of the grain from the shaft. The grain is collected and the chaff/straw left on the field to be baled later. The Blue Cranes followed the combine wherever it went! And lastly the baler is brought in. 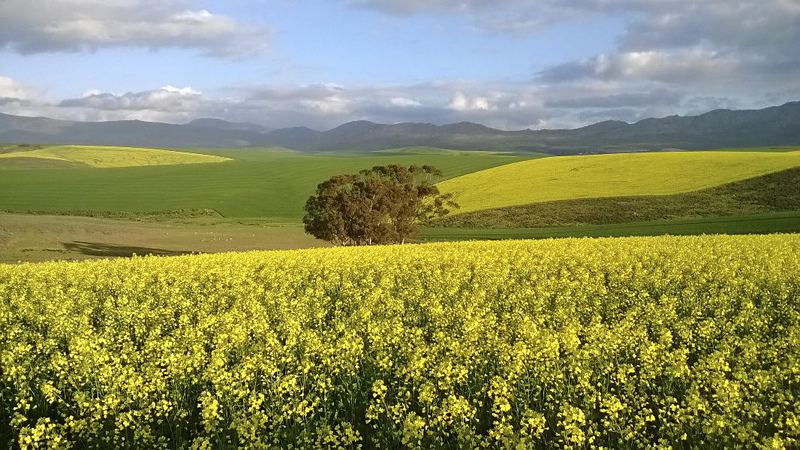 Jan van Dyk of the farm Hartebeeskloof near Stanford in the Overberg was five or six years old when he first drove a tractor all by himself. 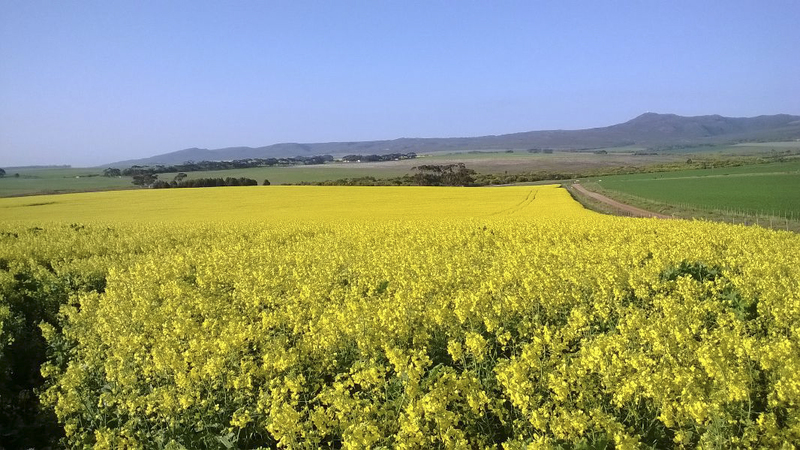 “It’s in the blood,” says Jan. As a youngster it was Jan’s job after school to take coffee to Hendrik Rooi, their farm labourer, to wherever he was working with the tractor on the farm. His mother’s warnings to stay away from the tractor and not drive it himself, fell on deaf ears. While Hendrik was enjoying his coffee and having a smoke break, Jan would be on the tractor, driving it to his heart’s content. At home he would be questioned by his mother as to why he “smelled of tractor so much”. “I have only been with Hendrik on the tractor while he was doing the driving,” he lied. Today Jan, the fourth generation van Dyk farming at Hartebeeskloof, is as passionate about tractors as ever. He now collects and renovates veteran tractors and farm implements and does all the farm work with tractors dating from the 1940s to 1950s. Jan is the proud owner of two 1942 Allis-Chalmers Model “M” tractors of which one is already fully renovated and in good running and working condition. His pride and joy is an International T-9 Bulldozer or crawler tractor which still starts promptly when its sling is turned! Then he has a Farmall Cub (the only Farmall built with an L-head engine), which was the smallest tractor in the International Harvester line, and capable of pulling one 30-centimetre bottom plough. The Farmall Cub was one of the most popular “small chore tractors” made in history as it was aimed at the needs of the small-acreage farmer. It was produced for almost 20 years, with over 200 000 of them built between 1947 and 1964. Seven or eight implements were initially designed for it: a plough, a disc, a backblade, a sickle-bar mower, belly-mower, and a one-armed front-end loader. Like the Farmall Model A, the Cub was off-set to the left with the driver and steering wheel on the right so that the driver could have a perfect view of a belly-mounted cultivator. There are also two Case tractors made by Jerome Increase Case’s company in Wisconsin. Case built their first steam engine in 1869 which was moved around by horses. By 1876 they had developed their first steam traction engine and the first Case farm tractor appeared on the scene in 1892. Their eagle trademark is patterned after a bald eagle, “Old Abe”, a mascot in the American Civil War. The oldest tractor on the farm is a McCormick-Deering 22-36 (the model number indicates the power output: 22 drawbar, a unit used to measure the pulling power of locomotives and tractors, and 36 horsepower, a unit of power output). These tractors were called “farmer engineered powerhouses” as the McCormick-Deering 15-30 tractor, originally built from 1921 to 1934, was a kerosene-powered steel-wheeled machine which developed 30 brake horsepower (± 22,4 kilowatts), and in 1929 the output was increased to 22 drawbar and 36 bhp (± 27 kW). This tractor, along with the famous John Deere “D”, completed the transition from horse power to horsepower. The early McCormick-Deering tractors were painted grey with red wheels; only in 1936 did the company switch to an all-red colour scheme. Jan’s collection of veteran tractors is completed by four Hanomag R545 Combitracs, manufactured by the Hannoversche Maschinenbau AG, a German producer of steam locomotives, tractors, trucks and military vehicles. The company, founded in 1835, made its first farm tractors in 1912; this division was sold in 1964 to Massey-Ferguson. The Cape Overberg is an incredibly diverse area of South Africa with scenes of striking beauty – a natural visual smorgasbord for amateur and professional photographers: from stunning seascapes with a backdrop of breathtaking mountains, covered in beautiful fynbos, hidden valleys and waterfalls; to patchworks of rolling hills of wheat fields in various shades of green interspersed with bright yellow canola patches in late winter and spring. 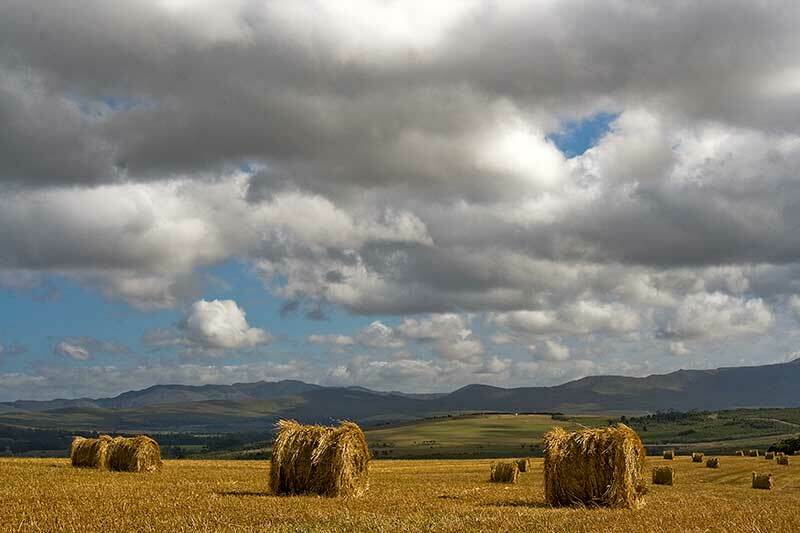 In summer the colours change to varying shades of gold with the ripening of the wheat, and during harvest the fields are dotted with hay bales. After the fields have been ploughed, the scenes once again change to various shades of red and brown according to the soil. Grazing sheep and cattle, Blue cranes, and various other bird species flying overhead, or feeding in the fields add to these bucolic scenes. It is also an area with a rich history, quaint villages and their quirky characters. 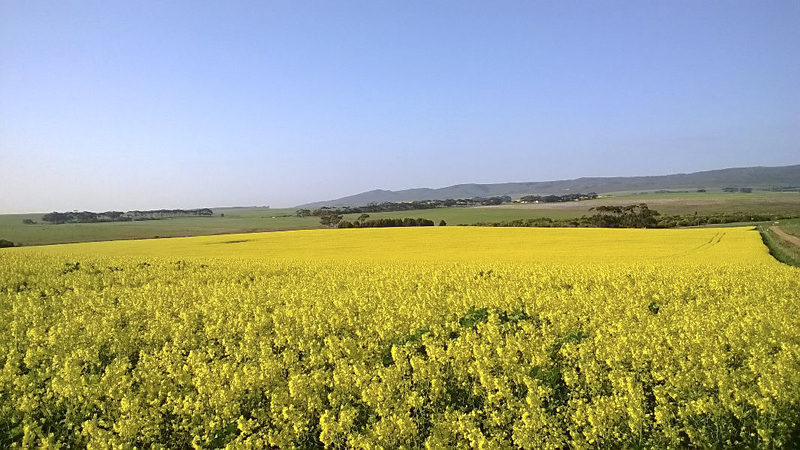 To whet your appetite and get you out for a weekend away on a photography outing, here are some beautiful pictures of canola fields by Jan Hendrik van Straaten of Caledon.